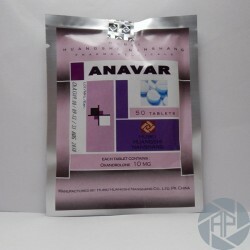 Anavar - a popular drug in recent years. In the markets of many countries is under many names, among which are, like oxandrolone, oksandrin, Anavar, anatrofill and others. The drug was first published in 1964. This anabolic steroid refers to a group of drugs designed to increase the extrusion and better delivery of the muscles of athletes, burning excess fat in the body, which increases the performance of power. It should be noted that the rate of drug use is more than silly recruit muscle mass. Anavar is the most appropriate for the bodybuilders who have sufficient muscle mass but are willing to get rid of excess body fat. Only preparation course can be used to a greater extent in the process of a set of muscle mass. The total length of the course varies from 6 to 8 weeks. During the course, you must be non-stop to see the State of his health. If the rate after 5 weeks revealed no deviations in the organism and there are no side effects of the drug can prolong course. 2 days after discontinuation of the drug, it is necessary to proceed to the top of a course of therapy. As in the majority of cases, it takes place with the use of tamoxifen. To avoid possible complications in the work of an athlete before the start of the course you should consult with your doctor and trainer. For a better rate of efficacy of this drug, it must observe a special diet and take sports nutrition. Start taking the medication with the minimum dose required, and more specifically to a dose of 20 mg per day. For best performance and actions and personal suitability of the drug, its reception can be divided into several stages - for example, in the morning and the afternoon. In the absence of side effects and other deviations of the organism, the dose can be doubled. In terms of the following course of therapy, received tamoxifen at a dose of 10 mg per day. It is done to restore your natural testosterone production. Athletes who take this drug say, first of all, it's good fat burning properties. The drug and burn excess fat not desired in the body of the athlete, giving it a beautiful and shiny appearance. The Oxandrolone is slightly a 17-rented steroid -Alfa of its toxic effect is on the liver. Studies show that Anavar 20 mg per day, taken for 12 weeks did not affect the level of liver enzymes (liver failure indicators). The early signs of liver damage is a pain in the right upper quadrant, colored light, and dark urine. Anavar is a derivative of dihydrotestosterone, which does not aromatize (does not convert to estrogen, which causes side effects such as Gynecomastia and the accumulation of fluid in the body). The drug has no significant impact on the production of natural testosterone, always as the dosage if the medication is moderate and optimal. But otherwise, the possibility of side effects such as decreased libido and erectile dysfunction, atrophy testicular. This problem is resolved by the admission to the course after drugs such as gonadotropin therapy. Among other side effects, sometimes may also occur such as loss of appetite, abdominal pain, headache, high blood pressure. In general, if not violated the dose of the drug, and there is no excessive duration of the passion of course, preparation is considered one of the safest and quality among all other steroids.